Mainly clear skies. Low 61F. Winds S at 10 to 20 mph.. Mainly clear skies. Low 61F. Winds S at 10 to 20 mph. 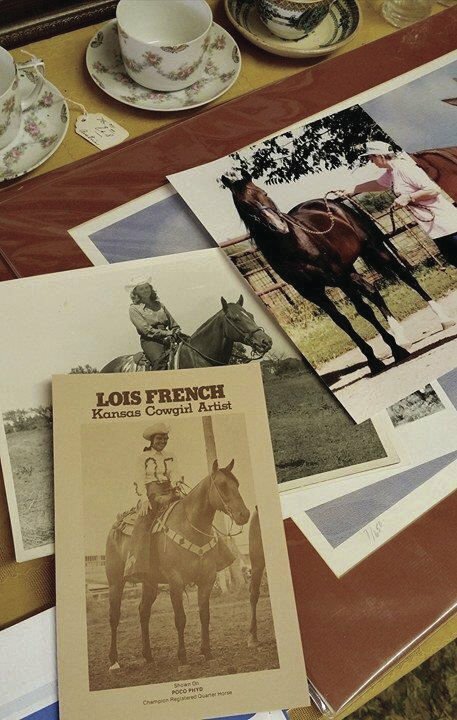 Lois French is filled with a passion for art and ranch life. Photographs, registration papers, drawings, clippings, and writings are among vast memorabilia of a lifetime of ranching, raising Quarter Horses and painting for Lois French of Eureka. Horses and drawing pictures of horses have always been two of the most favorite things in life for Lois French. Well, maybe a hiatus from sketching when supposed to be studying, but never from French’s heart. “I just couldn’t get drawing out of my system,” she said. Just as strong was the girl’s fondness for horses and ranch life. Born and raised in the Flint Hills, Lois started riding at the age of 2. Appropriately, Lois found a cowboy with matching love for ranching. Mary Lois Burke married Murray French on May 21, 1942, in Eureka, Kansas. The newlyweds made their ranch home near Climax in Greenwood County where Lois still lives today. Operations are considerably smaller scale now than peak times when Murray and Lois French were widely known for Herefords and Quarter Horses. Registered Herefordcows grazed owned and leased acreages with the French Hereford seedstock demanded over a wide area. “We had 500 cows — sold breeding bulls. We had two bring $10,000 apiece. That was a lot back then,” French said. Still reflecting about their foundation Quarter Horses brings more excitement to French’s conversation. She readily and intimately remembered those horses like it was yesterday or today instead of more than a half century ago. 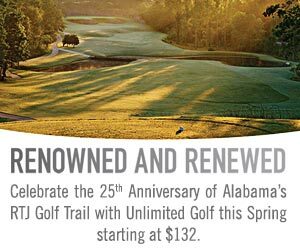 “We got started with the Peter McCue line from Harry Lewis at Beaumont, then discovered Harlan’s Tyree owned by Carl Mills at Cedar Vale,” she reflected. Setback for the breeding program came with passing of Tyree at just 7 years old. “Fortunately, we had some of his daughters and mated them to sons of Poco Bueno,” French said. They were among the best collecting numerous horse show awards throughout the Midwest. “I liked cutting best, won the Greenwood County Fair three years, and I have the trophy to prove it,” she said. As if not busy enough, French also had a tax preparation service for a number of years. When the French breeding operation slowed down, Bob and Pat Ward at Chisum J Bar J Quarter Horses, Macomb, Oklahoma, acquired several horses and continue raising the lineage. “We got a nice mare from Murray and Lois about 20 years ago,” Pat said. “We had so much success with the mare that we purchased additional horses bred the same way. “After we became acquainted with Murray and Lois, we were fortunate to add more of their own horses as they were dispersing,” Pat added. Never having children of their own, Murray and Lois were married to each other’s brother and sister. Their children, nephews Dan and Larry French were adopted by Murray and Lois. While not continuing the renowned horse and cattle breeding, Dan and Larry assist with ranch operations. 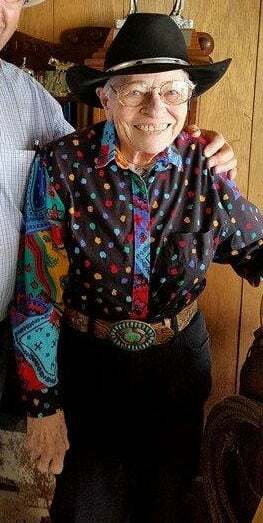 Both live at Eureka and check in with Lois on a daily basis, as well as providing guidance in overall ranch management. “Lois is truly an inspiration. We help out with her 10 cows some, carry the grain buckets, whatever else she’ll let us do,” Larry said. “Lois has an art gallery in Eureka, and we help maintain it, too,” Dan added. Childhood love of drawing continued such that in adulthood, she studied drawing and painting with several top artists including the late Lawrence Coffelt of Emporia. “Now painting more than four decades professionally and for pleasure, Lois’ love of horses is the driving force for her works,” said J.L. Tunison, rancher, friend and long-time admirer of French’s artwork. “Her lifetime experience riding and raising horses assure accuracy of her work,” Tunison said. Her paintings have been widely displayed on magazine covers and featured in several one-person shows. Painting Western, wildlife and rural scenes representing her life, she’s had special showings in Arizona, Colorado, Kansas, Oklahoma and Texas. The art pieces are in collections of museums, corporations and individuals in 15 states, the United Kingdom and Europe. “I try to work at the gallery several days a week during the summer, but I don’t get there as often during the winter,” French said. However, she’s always anxious to talk with others about the paintings on the phone at 620-583-6704. Additional contact information and samples of her works are at www.loisfrenchfineart.com. While stiffness has limited certain creature finesse, Lois’ paintings of rural scenery reveal nature’s beauty at its best. One might wonder how she keeps going so actively with such enthusiasm. “I have a garden, grow herbs, produce my own fruits and vegetables, can some of them, try to eat healthy, always have,” she said. “You need to keep going, get plenty of exercise and then have a good night’s sleep,” she added. Forever with strong appreciation for rural life, French said, “Mother Nature is the dominating power whatever anybody says, so you’d better admit it, and know She’s right if you’re going to get along. “Thank God for that,” she added.